Le French Book (NY), 9781939474629, 274pp. 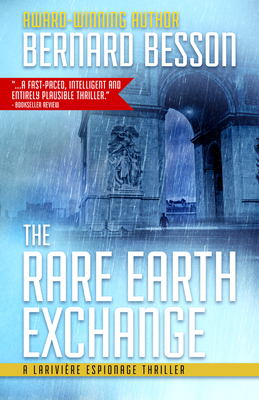 A team of freelance spies gets caught up in a web of corruption and terrorism in a struggle to control rare minerals key to today's technology. Panic strikes at the highest levels of the French government when the former president is found hanging from the rafters in his home right after a terrorist attack at the airport. Is it suicide or assassination? Freelance operative John Spencer Lariviere, his karate-trained partner Victoire, and their computer-genius sidekick Luc must find out what he was hiding. Quickly, the investigation turns into a globe-spanning confrontation in a world of high-frequency trading where manipulation and corruption reign. Lariviere races against the clock to find out who is pulling the strings.